I arrived back at Willamette Humane Society this afternoon after having been gone almost two weeks. 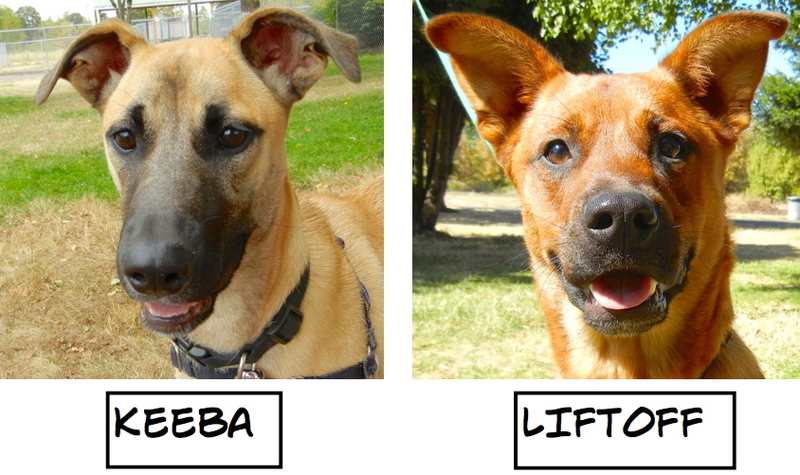 I had many new dogs to photograph for the WHS website. 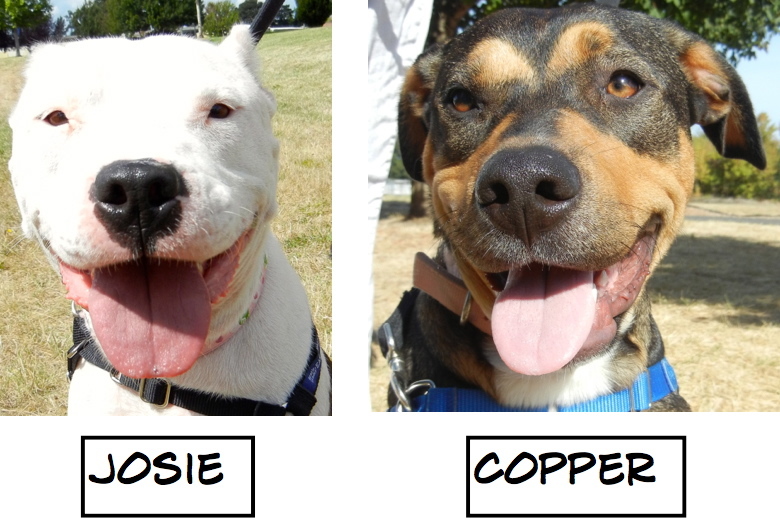 I am so grateful to my fellow Wednesday dog walkers for letting me snap photos before and after their walks. It was great to be back with the dogs and the walkers. There have been many adoptions since I last posted. Most of the photos below are Blog Dogs, but a few are of other dogs I met but didn’t get a chance to write about. I wanted to report on their happy new lives, too. As you noticed in the photos above, Cassie Jones was adopted. This was thrilling news for all of her many fans. Cassie had been at WHS since June. 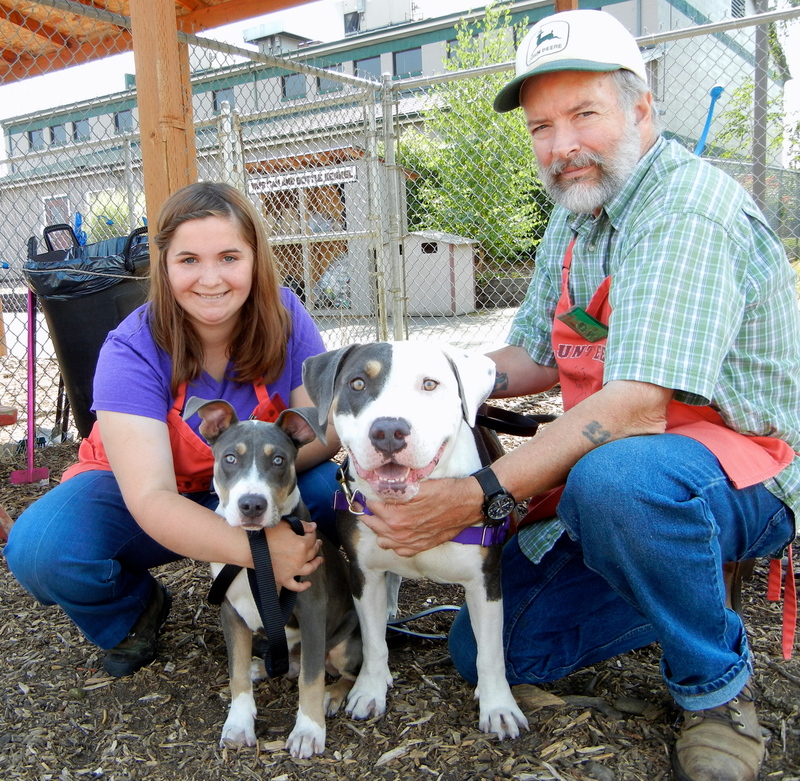 She had won the hearts of both staff and volunteers. She was taken on many respites and recently was being fostered by one of the dog walkers. Then last week she was discovered by a man who was looking for his perfect companion. I happened to be at the shelter when they met and got this shot. It was a happy, happy day! 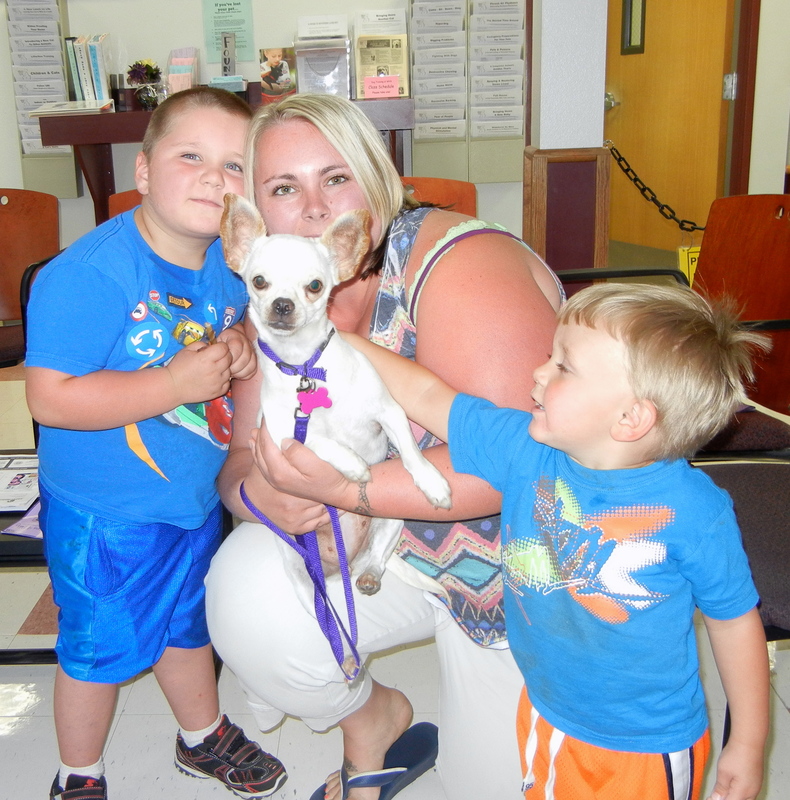 I got another adoption photo when this family was about to leave the shelter with their new family member, Frenchie. I never got to meet Frenchie, but I could tell she was going to have a wonderful future! I have one more adoption note. If you are a regular reader of my blog, you know Galaxy, as she was featured in my last post. 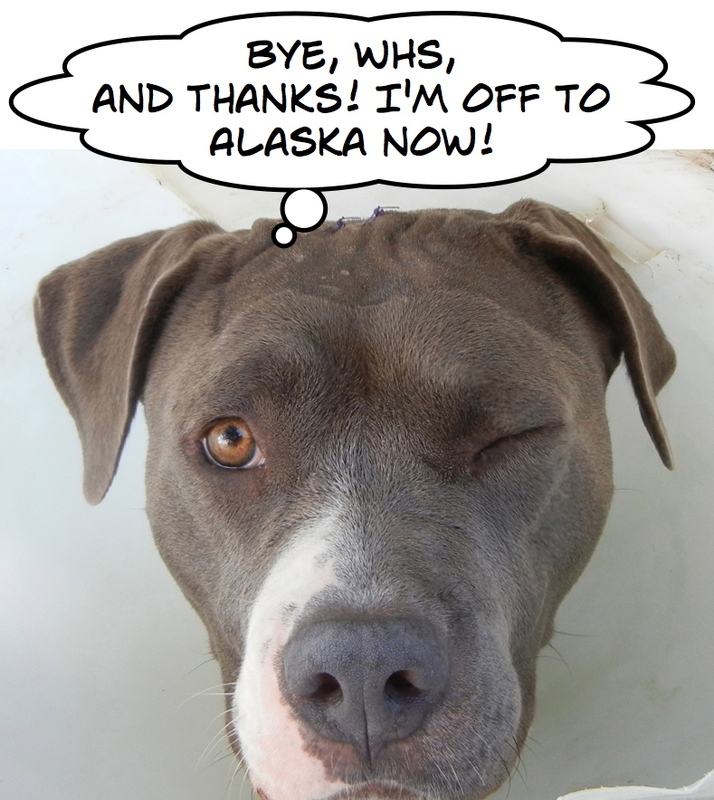 She was brought to WHS from a shelter in Fresno, California, having been found there as a stray. A lady visiting Portland from Alaska happened to see her on my WHS Facebook page and sent me a message asking questions about her. I sent pictures and everything I knew about this big lap dog. It was love at first post. 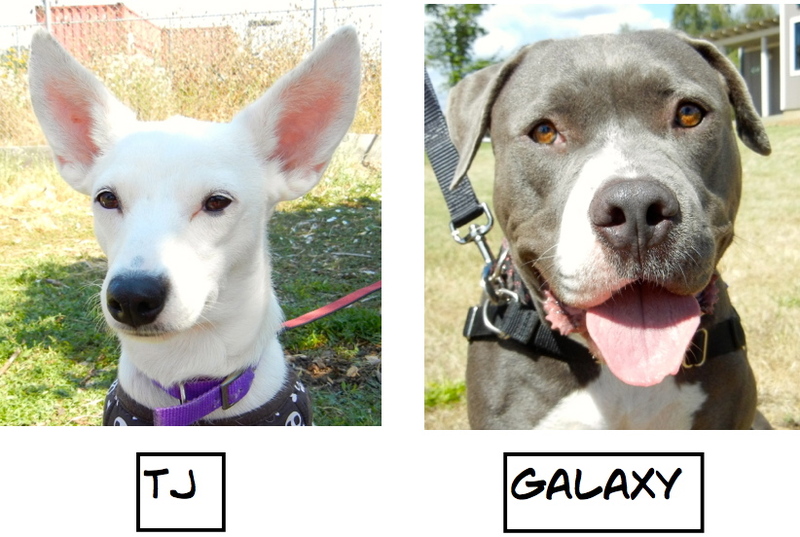 The lady arranged to drive to Salem on Sunday to meet Galaxy in person. She had already emailed me that she was “100% sure” she’d be adopting her. I was excited to tell Galaxy the news, and as you can see, Galaxy was pretty happy, too! One last detail before she left on her big trip was having Galaxy spayed. That was done this week. 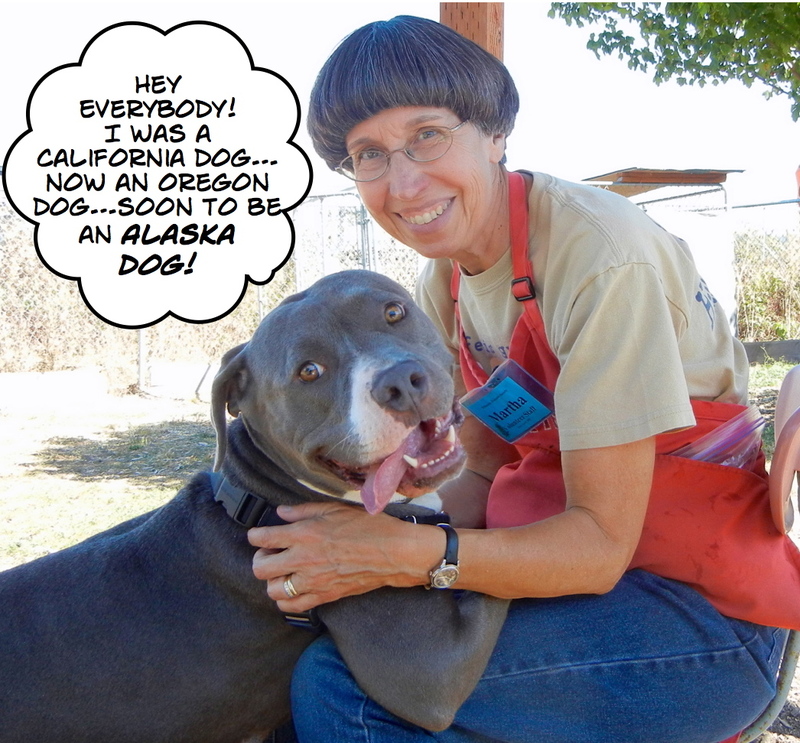 Tomorrow this California stray will be heading north. 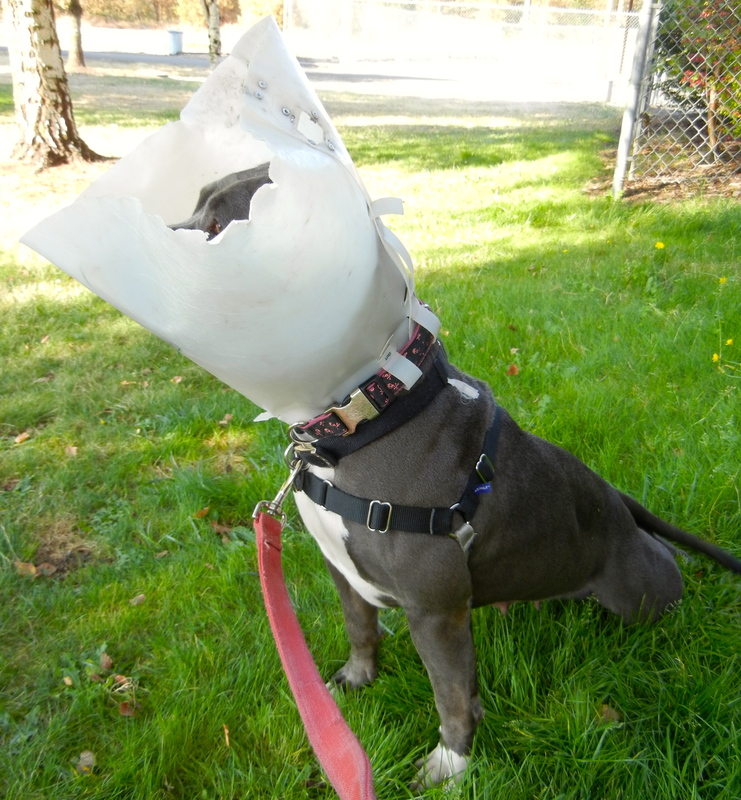 Here she was today, having to wear a cone after her spaying. I told her it would soon all be in the past and she’d be on a grand adventure. I gave her some hot dog bits and hugs. From inside her cone, she gave me a wink as if to say goodbye. Have a wonderful life, big girl! I’m a little shy and looking for a quiet home. Could it be yours? 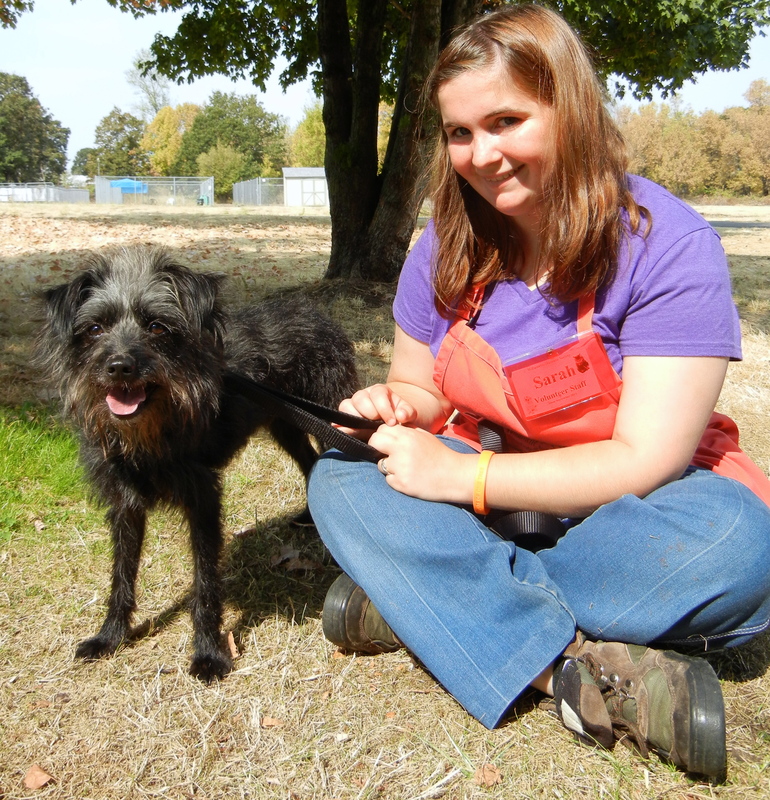 One of the many new dogs I met today was Cole, a two-year-old Miniature Poodle/Terrier mix that Sarah was walking. 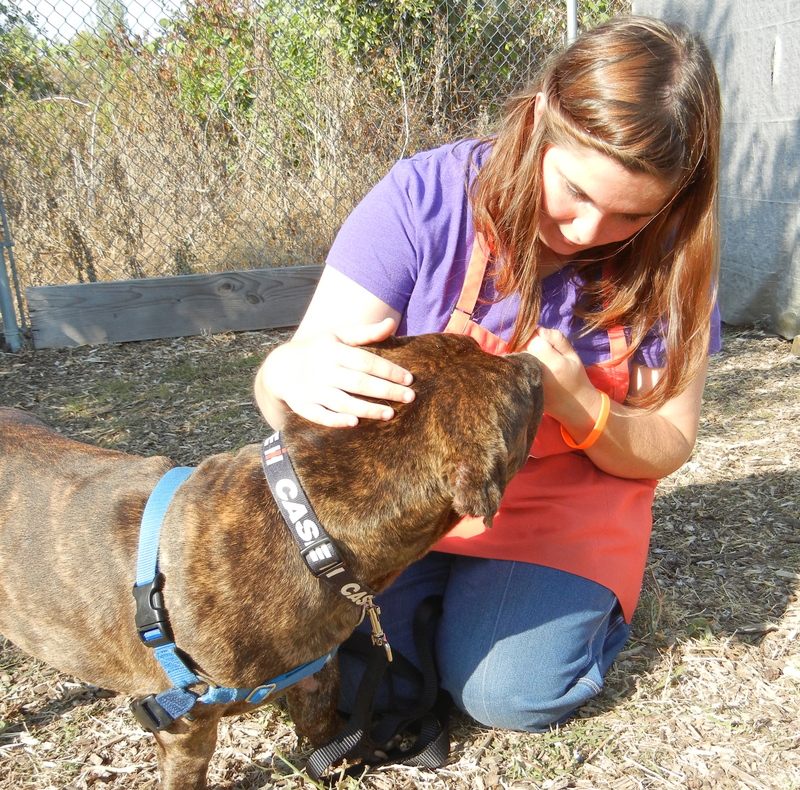 Cole is shy at first meeting, but is very calm and loving once he relaxes and feels safe. He will make a great companion for someone with a quiet lifestyle who is looking for a good friend. He’s a very cute little guy. Yep, I’m a little older, but don’t let that stop you from adopting me! 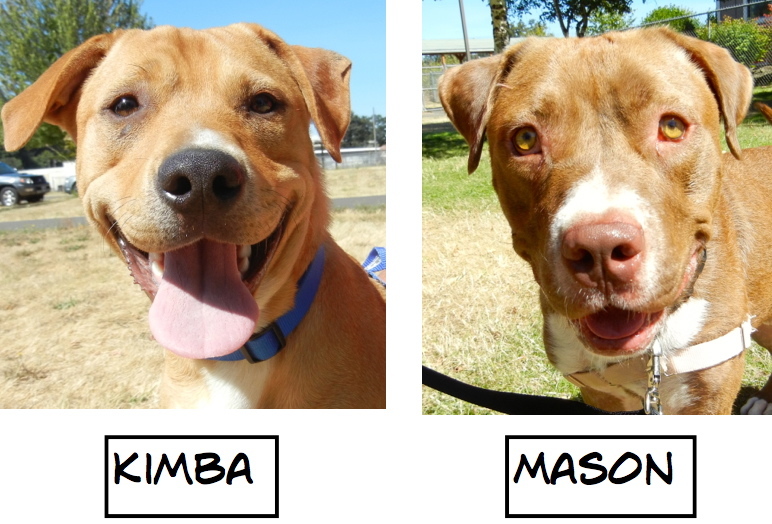 On Saturday I made a special trip to the shelter to meet a dog that one of my WHS Facebook readers asked me to get to know. 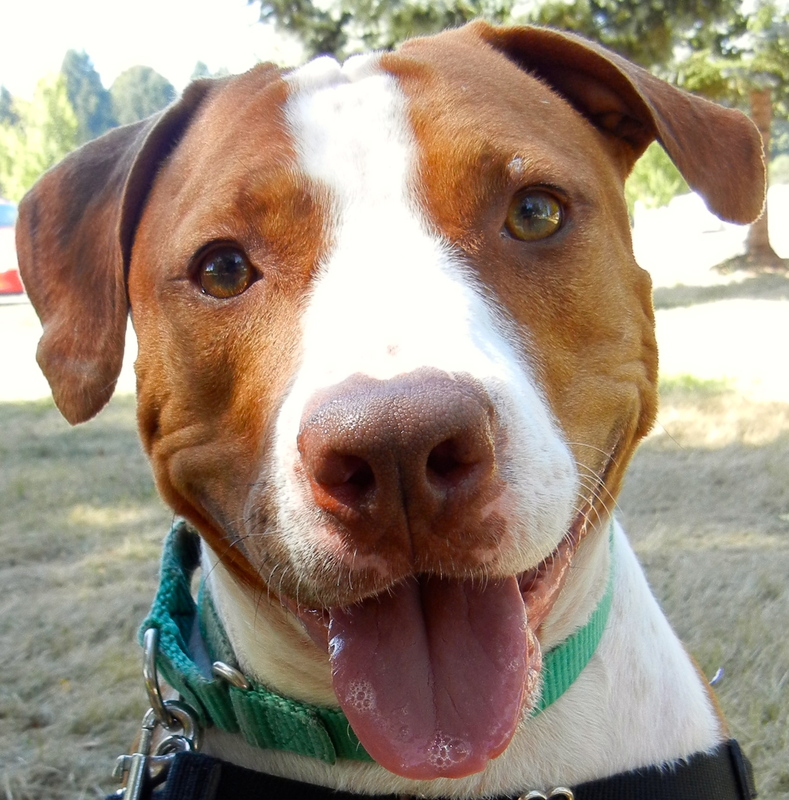 This is Tido, a seven-year-old Pit Bull Terrier mix who came to us from a shelter in Redmond. 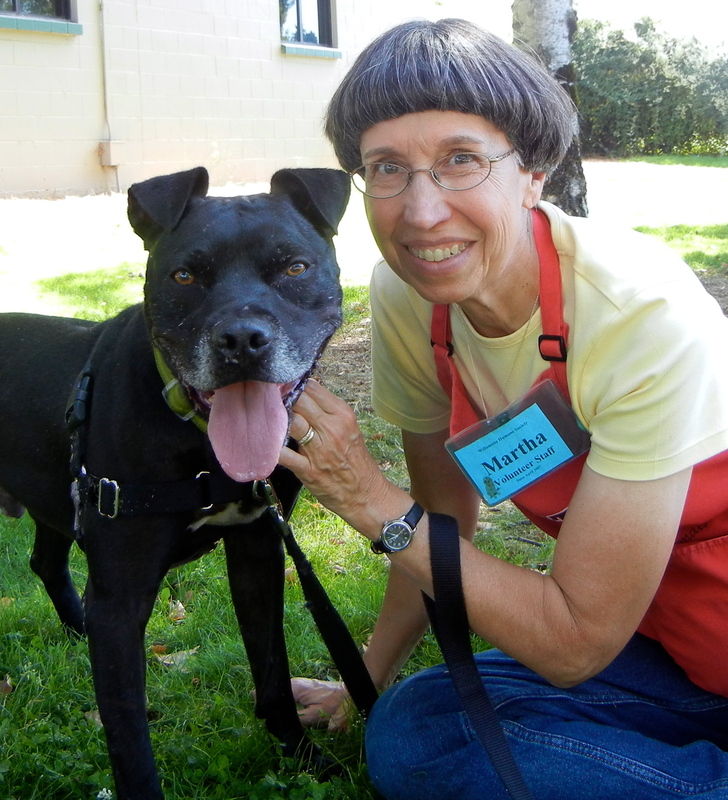 Mary is a volunteer at the Redmond shelter and spent a great deal of time with Tido both at the shelter and during respites. 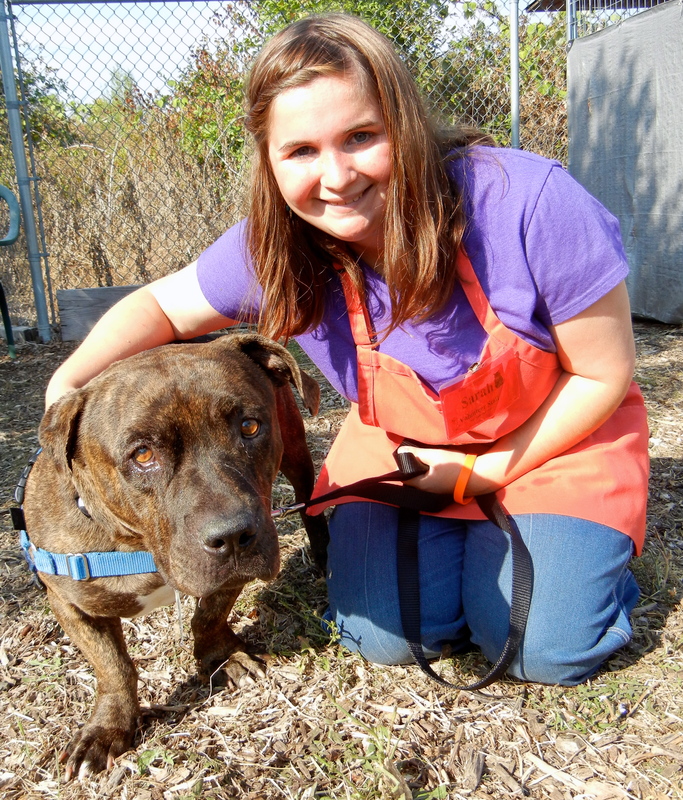 She became very attached to Tido over the months he was waiting for a family to adopt him. 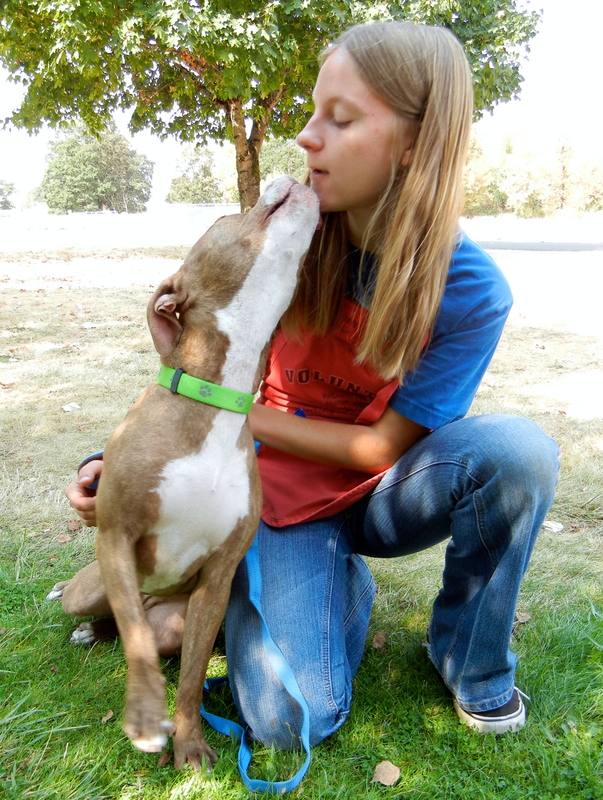 When no one came, though it was very difficult for Mary, she supported the decision to send him to us, hoping that he will finally find his forever home in Oregon. It did not take me long to realize why Mary loves Tido so much. He is simply a perfect dog! 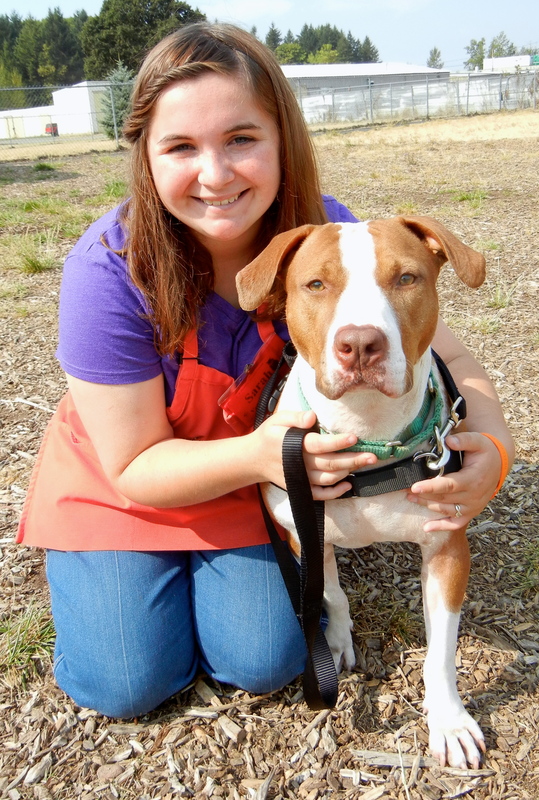 He walks well on leash, knows basic commands, and loves, loves, loves to play fetch. Don’t let his age fool you. 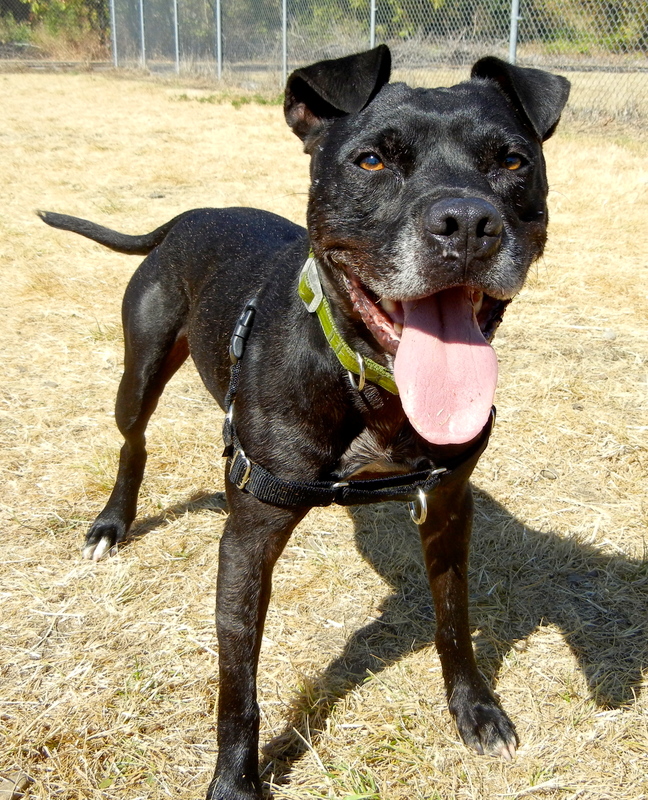 Tido has a ton of energy and will race after a tennis ball over and over, returning it to you in exchange for a treat. But if you want to relax awhile, he will happily lie by your side. He has lived with other dogs and cats. He has even taken a K-9 nose class and done very well. 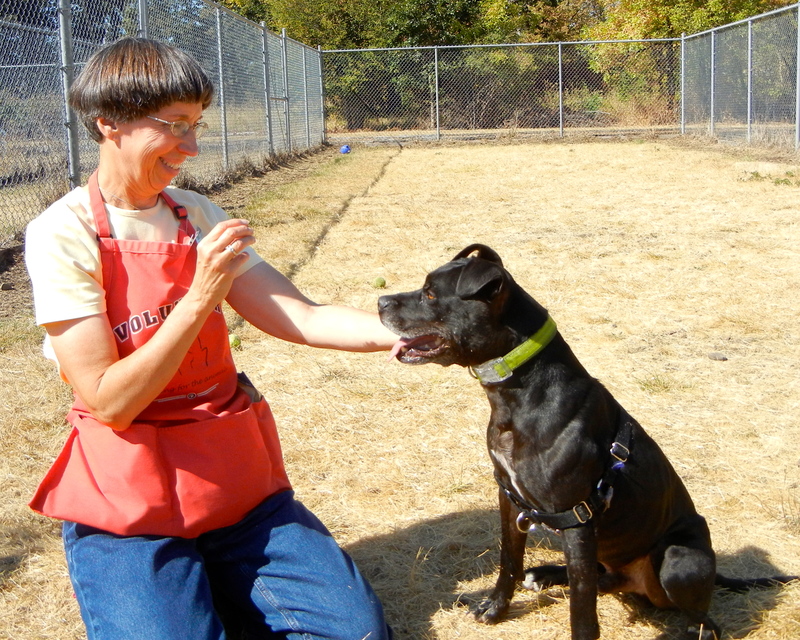 Tido is a very special boy and like in Redmond, has become a staff and volunteer favorite. 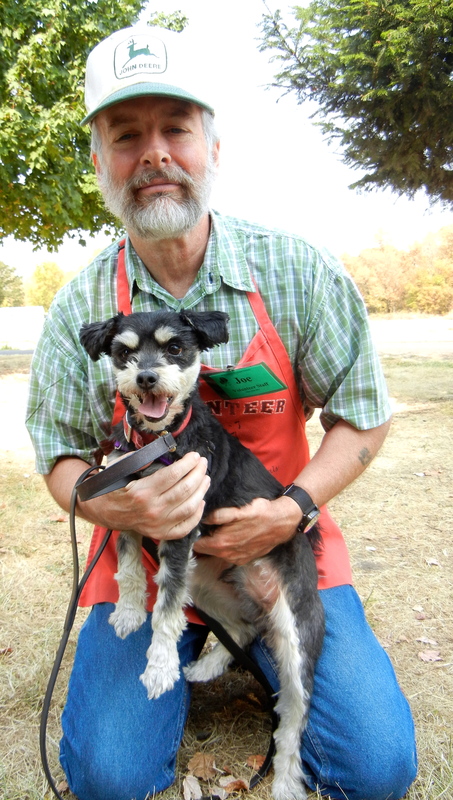 We are hoping we’ll soon be able to tell Mary that he has found his new forever Oregon home. What do you MEAN I’m not a BIG dog? If you are a lover of Terriers, this may be the dog for you. 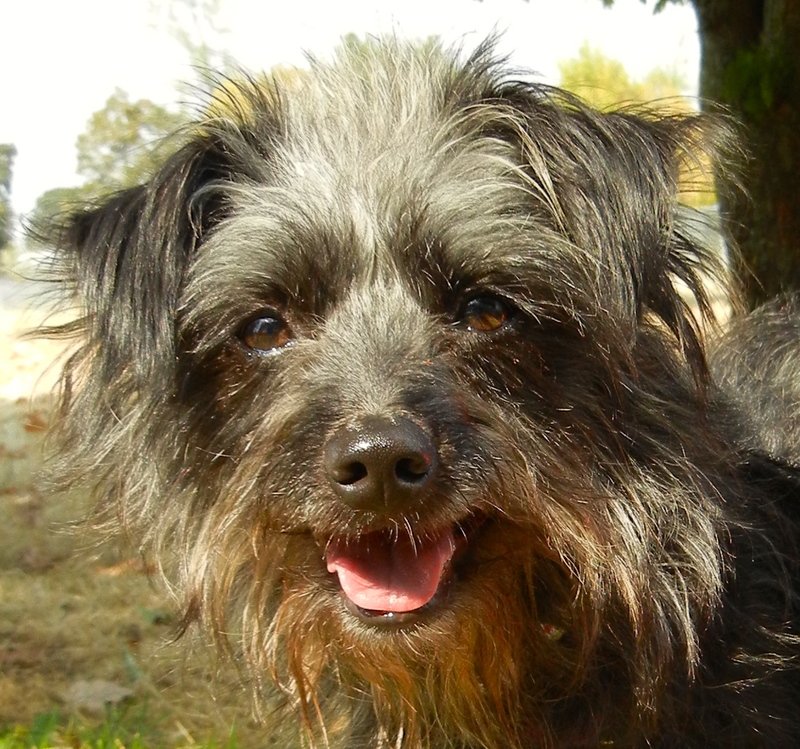 Meet Johnny, a five-year-old Toy Poodle/Terrier mix. 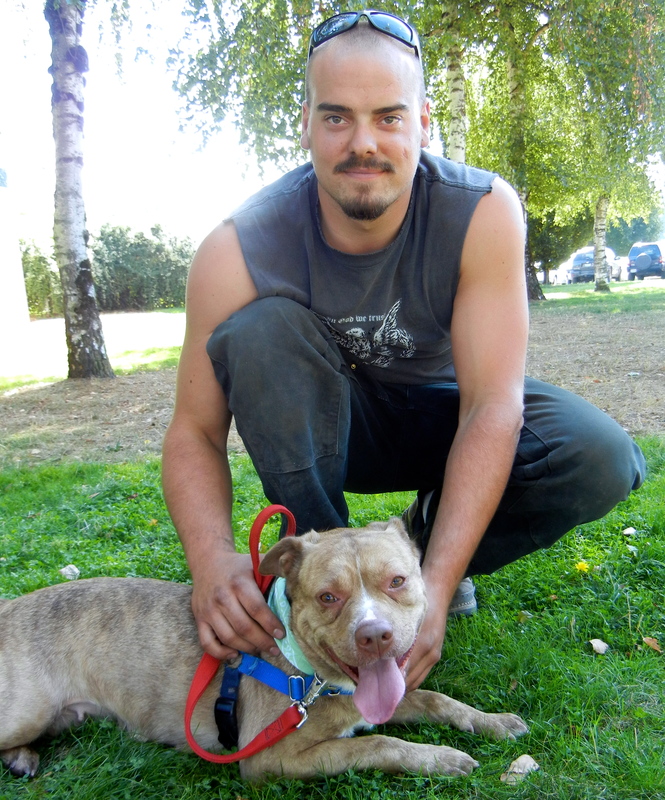 Here he is today with volunteer Joe. Johnny is convinced that he is a large dog, although he happily sits in your lap. He is an active little fellow and will be the perfect addition to some lucky family. It didn’t take Emelynn long today to decide on her favorite dog. 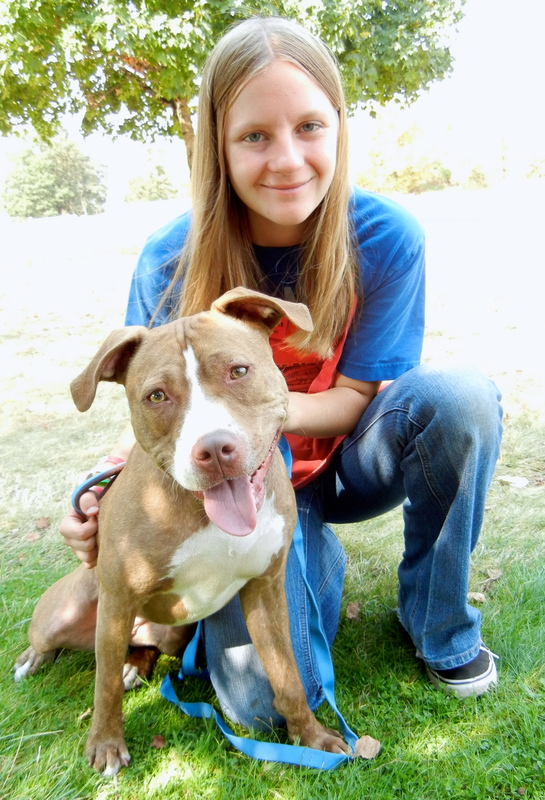 She quickly chose Dee Dee, a one-year-old Pit Bull Terrier mix. Dee Dee is active and loves to play. Since she is just now growing out of being a puppy, she would be the perfect candidate for some of our WHS training classes. She needs a little work on walking on leash and basic commands, but will be a quick study. When I asked Emelynn if Dee Dee liked to play fetch, she said, “Well, kind of.” (That means when she’s in the mood.) I love her expressive face! She decided that Emelynn would make a very good friend. Dee Dee will be a delightful dog for an energetic family. 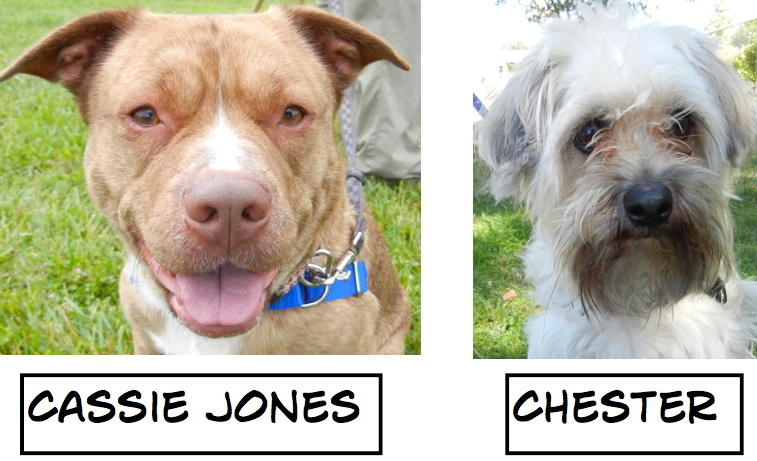 I keep hoping that I’ll be able to announce Annie and Tootsie‘s adoption, but so far, no luck. 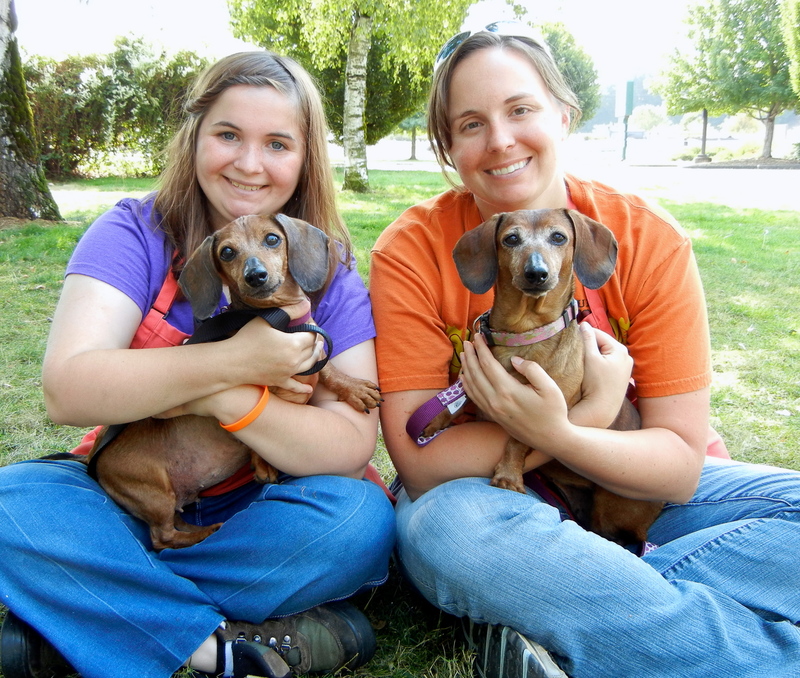 Here they are again today with Sarah and April. Annie is 12 and Tootsie is 10. 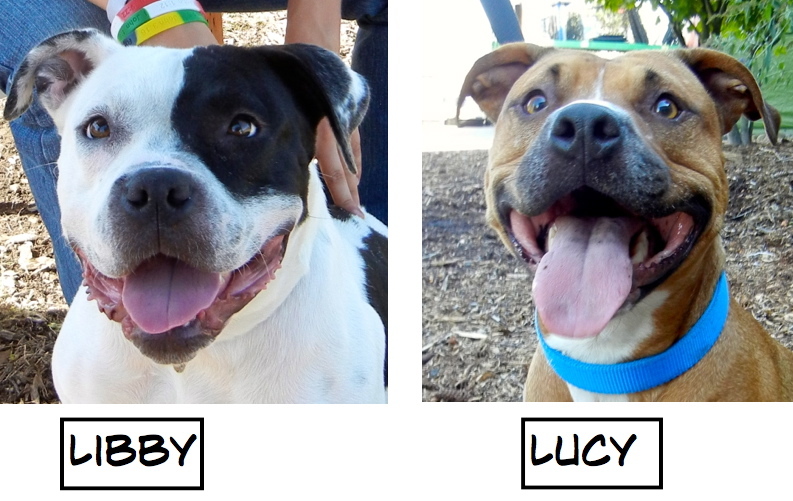 They are remarkably active for their ages and love attention as well as hot dog bits. Maybe the perfect person will find them this week. I’m one of Sarah’s favorites! 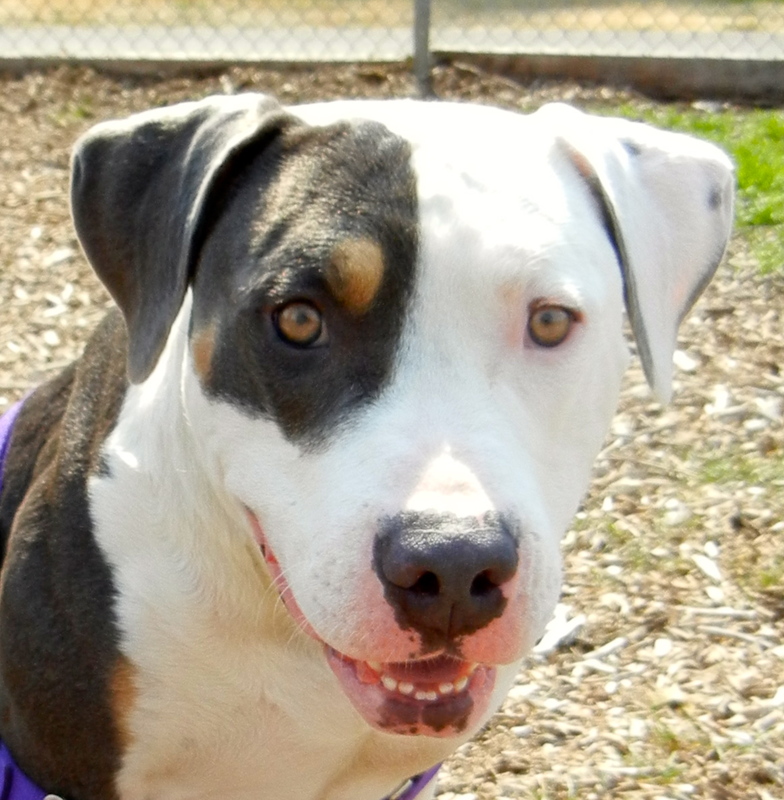 This is Gia, a two-year-old Beagle/Bull Terrier mix. 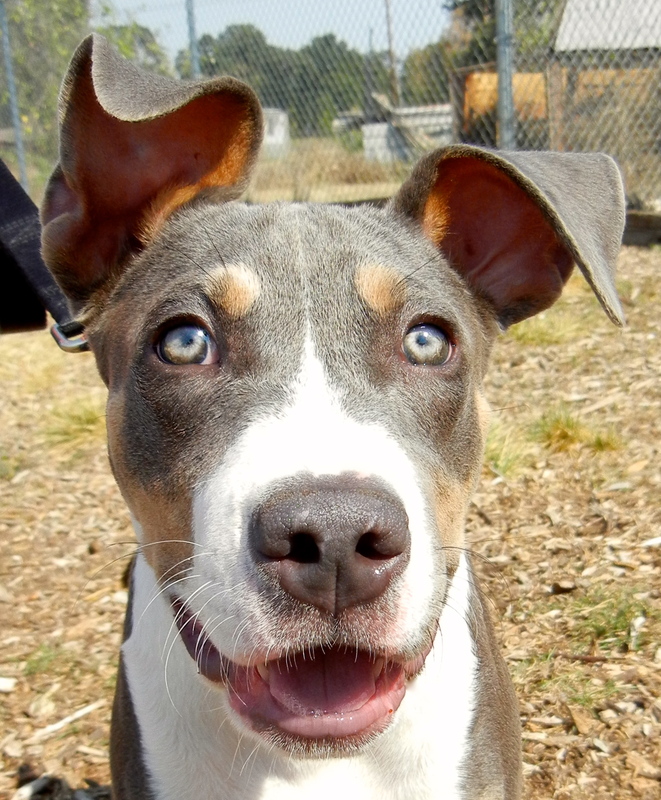 She is a playful girl who knows some commands, likes to be with people, and did well with other dogs in play group. This is her intense look as she stared at my hot dog bits. Sarah loves her good nature and happy spirit. Yep, I’m a big body with short legs. The last dog I photographed today was Rex, a one-year-old Pit Bull Terrier mix who is unlike any Pit Bull Terrier I’ve ever seen. I thought at first he was lying down, but he wasn’t. He has very short legs. But that doesn’t stop him from trotting along beside you. Rex is a quiet boy from California. When I looked into his eyes, I wished he could tell me his story. He touched both Sarah’s and my hearts. Personal note: My Blog Proofreader (otherwise known as my husband) is out of town and unable to read this post before I publish it. I have read it over several times, hoping to catch all mistakes…but I may have missed some. I am wondering what happened to BJ, the big beautiful Great Pyrenees mix?